When you’re a long-distance caregiver, everything involving your senior might leave you feeling as if you only have a portion of the picture. These tips can help you to expand your information network so that you’re as informed as you can possibly be. Whether you realize it or not, there are lots of people in your senior’s life right now. They can be a key part of understanding parts of your elderly family member’s life that you might not have seen in other ways. These folks might be neighbors, friends, and other people that your elderly family member encounters on a daily or weekly basis. When you have a relationship with them, they can help you to spot when things don’t look normal or as they usually do. You might not realize it, but there are professionals who encounter your senior who can also help you to determine when something might be off. This could include folks at her pharmacy, her mail carrier, and any number of other people who see her regularly. It’s important to try to build a relationship with these people if you can so that you have some eyes on the situation. Even if you worry that this type of network is not one that you can build from where you are, you might be surprised. You probably already are collecting as much information as possible about your senior’s health, her life, and so much else. Each bit of information that you collect allows you to build a network of people you can contact who can help you keep an eye on your senior. 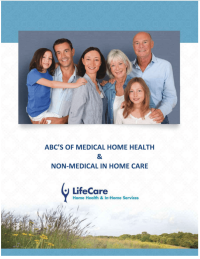 Home care providers are another solution that can help you way more than you might think. They can be there at varying times or on a set schedule. They can help you to know when your aging family member’s routine is not the same as it usually is and whatever else they’re witnessing. That information can be vital when you give it to her medical team. When you’re feeling as informed as possible, this gives you the confidence to make the decisions that your senior needs you to make. Confidence in your decisions helps you to keep making those big decisions that fall on you as a caregiver. If you or an aging loved-one are considering hiring Senior Care in Northfield, IL, call the caring staff at LifeCare Home Health & In-Home Services. Call (888) 606-4199 LifeCare serves all of the Chicago Metro Area.